A Schema define the inputs and outputs of your Jobs. Whether you're reading or writing from Databases, flat files or other data sources, schemas define how data moves around your Job. Any component that supports data flow provides a Schema Editor that allows you to see and define the schemas that are used by that component. Components may use schemas that are defined by Repository objects, and you may also use copy & paste to copy schema elements from one component to another. Although you can manually define schemas for each of your components, a much easier approach is to define schemas through Repository Metadata. This is especilly important if you intend to use the same schema definition more than once in your Job, or use it in multiple Jobs. Many of these repository definitions can use wizards that can not only read a source definition to define your schema; but can also sample data to determine attributes that cannot be obtained from the source definition alone. A good example of this is Repository->Metadata->File delimited. You can also define Generic schemas, where a specific schema type is not available. 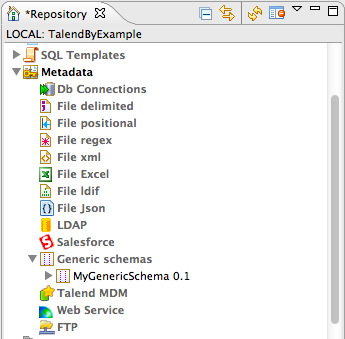 Talend allows you to copy & paste columns from one schema to another. Select all of the Columns from the ReadGeneralContext schema and use the buttons to copy the LoadGeneralContext schema and to paste it to the ReadGeneralContext schema. You can multi-select columns by selecting the empty left-most column in the schema and using the usual multi-select features of your mouse or cursor keys. The following image shows the Repository Browser, where a single Generic Schema ha been defined, named MyGenericSchema.